MINNEAPOLIS — Everything from the concert tickets to the ads in the paper to the marquee out front of Minneapolis’ Orpheum Theater said it was Wilco playing Monday night. But you can hardly blame any concert-going layman for posing the question: Who is Wilco these days? Where once the Chicago group was the lovable, archetypical alt-country band that seemed destined to slip effortlessly into classic-rock radio programming, band leader Jeff Tweedy has pushed and shoved his group in ever more avant-garde musical directions during the last decade until they now resemble a kind of art-rock, post-punk jam band. In fact, this is the third (or fourth) configuration of the band to tour the country in the last four years. Hardened fans who have consistently made it to the group’s shows have come expect to see some new faces in the group and new sounds each time. They know Tweedy the songwriter is committed to musical evolution no matter the human cost (fans or bandmates). The group’s new attitude was evident from the opening song, “At Least That’s What You Said.” The song opened with Tweedy singing in a near mumble and gently playing his electric guitar. If his compatriots were playing anything, the sound was turned way down. It was only a couple of minutes in that the band finally kicked in together. The music suddenly lunged forward with stabbing thrusts, and the song reached its apogee with Tweedy leading new guitar ace Nels Cline into a series of screeching solo runs as newbie keyboardist Pat Sansone slapped his open hands on the keys. Since the band’s last tour, Tweedy has perfected his own unique “guitar solo” pose. He stands completely erect and twitches and shakes in one spot as he plucks the disconnected notes and abuses the guitar’s tremolo bar. Fears that Tweedy was going to force the audience on a mind-numbing journey via his guitar on each song looked like a real possibility, but he threw everyone for a loop with the next song “Hummingbirds” by going without a guitar. The band played the highly dynamic song with effortless perfection, although it was truly an odd sight to behold. Tweedy has become so identified as singer-songwriter, and it was strange to watch him uncomfortably move about the stage with the mic in his hand like a Robert Plant-like frontman. He certainly didn’t look the part dressed as he was in a suit jacket and button-down shirt. His awkward movements made him come across more like an uncle singing karaoke than a rock star. It was also curious to see how much room the band gives Tweedy onstage. He stood must of the night on the front edge of Persian rug near the mic stand, and yet all of his bandmates were pushed off from the center and kept their distance, giving him a several feet wide bubble. (Only longtime bassist John Stirrat broke the invisible barrier and stepped on the rug’s outer edges as he played or added backup vocals). This stage setup really reinforced the perception that Tweedy is the only thing worth paying attention to onstage and the band is just a side attraction. Wilco kept the audience’s gaze (and favor) by mixing in a few choice selections from their back catalog. The group’s set was dominated by their newest songs (about half the set), including old and rarely played favorites like “Candyfloss,” “Kingpin” and “Via Chicago” kept the crowd enthusiastic. So much so that the audience was stomping until the band came back for two encores. The band was impressive, sounded tight and consistently complimented each other. For “I’m Trying To Break Your Heart,” Tweedy played the troubadour on an acoustic guitar as the keyboardists concentrated on building this hum that underpinned the rather abstract melody. Meanwhile, drummer Glenn Kotche somehow made the downbeat sound like a groan before he switched over to a xylophone. On “Handshake Drugs” and “Shot In The Arm,” Tweedy and Cline took ample space to whale on their guitars. “Handshake Drugs” sounded less glum than the album version and “Shot In The Arm” roared to life. Both cuts concluded with the guitarists playing trilling solos and scrapping the strings that faded into white noise. “Jesus etc.” sounded more like a straightaway ballad with Cline played pedal steel guitar in absence of a violin. For a new embellishment, Sasone added some reggae-like keyboard fills. Tweedy was obviously in a good mood, and kept his sense of humor when he chastised an unruly audience member who was taunting other audience members. At the start of the encore and just as Kotche kicked into the first two beats of “Candyfloss,” Tweedy signaled the band to stop. He even kept his wits about when his guitar cut out just as he was about to take a solo during the snarling “Kingpin.” As a roadie worked to hook everything up again, Tweedy motioned the audience to watch the footage of fireworks being projected behind the band. The group filled too, Sasone improvised some piano licks and Cline played slide guitar to compensate for the lack of an “Up On Cripple Creek”-like clavinet. With all the good vibes, the inclusion of the old war horse, “Misunderstood” was the show’s major drawback. The track is one of those rare songs that should really only be played when the performer is really into, and can sell it effectively. It is a song of such defiance and bitterness and when Tweedy can be seen smiling only moments before, it comes across as pale compared to past performances. Instead of an obvious expression of the performer’s feelings, it seemed more like acting and diminished the threat contained in the lyrics. Tweedy was clearly speaking from the heart when he devoted the band’s last two songs to political concerns. While making his preference for Democratic presidential candidate John Kerry clear, he asked everyone in the audience to vote in next week’s election (he also shrugged off the persistent criticism of celebrities talking politics when he said that he was just a rock singer speaking his mind while politically-biased media interests do the same thing and reach many more people). He also appealed to any of the George W. Bush supporters in the crowd and dedicated “Be Not So Fearful” to them. The inclusion of “Christ For President,” a song from the “Mermaid Avenue” albums the group cut with Billy Bragg, between Tweedy’s political sermons was obviously appropriate. But more importantly, the song — with its sea-shanty rhythm and jug-band feel — was a brief glimpse of what once was. It was reminder of how far the band has changed in the last few years. 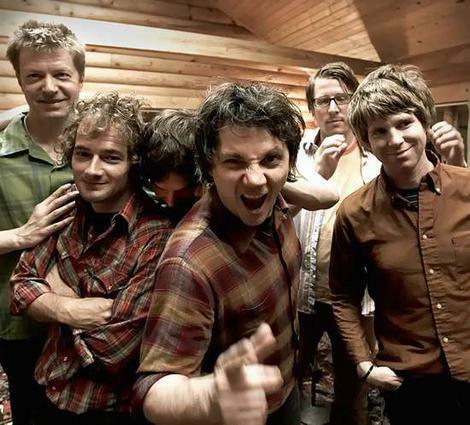 Half the group is brand new, with almost no connection to Wilco’s origins in roots-rock. The concert answered the question. Wilco is whatever Jeff Tweedy says it is and that’s what makes the band still viable. Opening act Deerhoof sounded just as they appeared: like a bunch of liberal arts college kids trying out an oddball art-rock project. The four-piece consisting of two lanky males on guitars, another on drums and a petite Asian singer named Satomi Matsuzaki, who’s high-pitched vocalizations in broken English was only out-weirded by her hopscotch-like dance moves or her use of stuffed animal vegetables as props. The West Coast-based group, signed to indie label Kill All Rock Stars (home to Sleater-Kinney), played Beefheart-like rock that matched angular guitar licks with frenetic drumming (the drummer perched on a milk crate as he slammed on his kit). The group was got polite applause between songs, but many in the audience seemed to treat the band as just a novelty. Between songs, members of the crowd could be heard chuckling at them — especially when Matsuzaki strapped on a hollow body guitar that was literally bigger than she was. Wednesday, Oct. 27, Madison, Wis.
Thursday, Nov. 11, Portland, Ore.
Saturday, Nov. 13, San Jose, Calif.
Sunday, Nov. 14, Oakland, Calif.
Saturday, Nov. 20, Tempe, Ariz. Tags: Glenn Kotche, Jeff Tweedy, John Stirrat, Minneapolis, Minnesota, Nels Cline, Orpheum Theater, Pat Sansone, review, Twin CIties, Wilco. Bookmark the permalink.